Ted Cruz's psychiatrist says he is a psychopath incapable of feeling emotions, but very capable of destroying the United States. 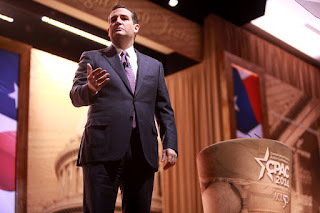 Senator Ted Cruz at 2014 CPAC. WASHINGTON (The Nil Admirari) - Today, the psychiatrist working with Republican presidential candidate U.S. Senator Ted Cruz of Texas announced he was rescinding his mental health clearance for Cruz to run for president. Dr. Hugo Eagle, a psychiatrist based in Houston, explained he thought it would be good for Ted Cruz to be thoroughly rejected by the American people, but he was very concerned there appeared to be a chance the psychopath could actually win the presidency. "Ted Cruz is incapable of feeling emotions or even mimic them in a convincing manner. He also lacks both charisma and charm, which I thought would doom his presidential run even though Ted is running as a Republican. I was naive, and should have known better," declared Dr. Eagle at a hastily prepared press conference. Dr. Eagle continued, "I cannot stress how dangerous Ted Cruz would be as president. Ted's life is a long story of antisocial and predatory behavior. Cruz completely lacks remorse and empathy, cannot create emotional attachments, and will try to destroy anyone not fooled by his naked manipulation." "I never expected Ted Cruz to get this far, and only cleared him to run for president because I thought it would be nice if Ted was rejected by the American people. Unfortunately, Donald Trump may inadvertently help Ted become president, and I cannot allow that to happen," confessed Eagle. An unidentified member of the press asked Dr. Eagle if he had concluded Republican presidential candidate and billionaire Donald Trump was less dangerous than Ted Cruz. "Donald Trump is definitely a narcissistic sociopath, but he lacks the practical knowledge to thoroughly destroy the United States like Ted Cruz would," replied Eagle. The Cruz campaign ignored TNA's request for comment, and Dr. Eagle referred TNA to the below video showing how even Cruz's kids know he is a psychopath.